totally free gift, it is personal and as unique as our fingerprints. invitation to visit us in person. and its grounds; without implying any kind of commitment on either side. a Christian and a Carmelite. This is a period of transition from lay life to life as a novice lasting about a year. Its primary aim is to help discern a person’s vocation. It allows a flexible adjustment to our life-style and the time, study and space needed for discernment. If, at the end of this time, a postulant wishes to continue and if the community agrees, she receives the Carmelite habit and begins the novitiate. The novitiate lasts about two years. This is the time to lay deep foundations for a contemplative journey that will last a whole lifetime. We learn that our vocation is completely centred on a relationship with Jesus, who sets us free to love as he has taught us. We find out how to look beyond our own needs to the needs of the Church, the community and the needs of all humanity. We deepen our knowledge of Scripture, Carmelite life – its saints and spirituality, our knowledge and love of the mystery of God through worship and study. Looking to Mary, our mother and sister, we ponder the scriptures as she leads us to ‘Do whatever he, (Jesus) tells you’. Study of the evangelical counsels of poverty, chastity and obedience, and the demands and freedom they offer us, is vital before entering the next stage of formation. The rhythm of the daily life is also part of formation, as is life in the community. Again, if the novice wishes to continue in Carmel, she freely asks the community if she may take temporary vows of poverty, chastity and obedience for three years. 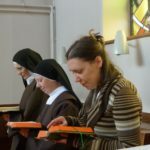 The temporary professed sister is still under the guidance of the sister in charge of formation and shares in the novitiate courses for two years. 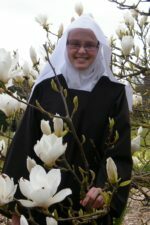 For the final year of temporary vows the young professed takes her place in the community, under the guidance of the Prioress. This year allows her to grow in increasing personal responsibility for her prayer, work, on-going formation, solitude and community life. Permanent commitment is not easy in today’s world and every help is offered in order that one can make a free and responsible decision about taking final vows. Solemn Profession is experienced both as something accomplished and as a new beginning. 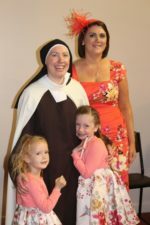 The sister is received with joy into the full life of the community. And she is asked to be faithful to the ministry of prayer and service entrusted to her. She receives a black veil – the Carmelite sign of consecration – which proclaims that she belongs entirely to Christ. 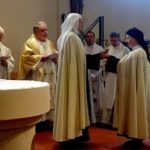 A Sister makes her Solemn Profession in the hands of the Prioress, who accepts it on behalf of the Church and the community.